I would not try to defend the Microsoft layoff letter – it is a missed opportunity on many fronts – but I can empathize. I’ve written a number of these letters and they are always difficult. It’s tough to balance the human interest with the corporate, HR, Legal and other interests that must inform the communication. When one goes as awfully wrong as this one did, commenters rage against the inhuman corporate entity and take aim, as ever, against The Man. Let’s assume though, that The Man is not the enemy; let’s assume The Man is misguided. A couple of thoughts…. Humanity deserves humanity: As cold as the naked employment deal is, though, it is always clothed in human terms. Companies need to remember this and communicate to the tenor of the agreement, not just the fact, behaving with integrity when bringing people in and when letting them go. What happens – or at least what happened to me when writing these – is the desire to offer an explanation goes haywire. It feels like it’s not enough to say we acquired a company that will lead us in the direction we want to go, and as a result, we are eliminating positions/skills we no longer need. People always want to add more – more details on the new direction, more details on why this direction was chosen, more details on why the people in place are not the people to make the future happen, and so forth. 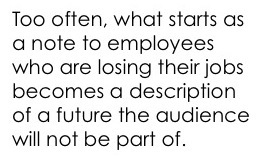 And soon, what starts as a note to employees who are losing their jobs becomes a description of a future the audience will not be part of. The Microsoft letter fell into this trap – far too many industry/company/future details and far too few what’s happening details. The authors of the Microsoft letter got lost in the Why. Why is always trouble because all paths through Why end at a “hope for the future” message. It’s unavoidable. What lets you exit gracefully. With humanity, the company’s and the employees’, intact. In fairness, we don’t know what other communications were sent to Microsoft employees. There might be many and they may be great. What we do know is that Microsoft missed an opportunity with this initial communication to demonstrate leadership, empathy, concern and gratitude, conveying reassurance to the employees who will be leaving (vs. to shareholders that there is a way forward). I do hope, though, that whatever communication(s) come next, the authors thank the employees who are leaving, the employees whose efforts made this next phase of growth possible.